American businesses have a lot of "we're hiring" signs up. There were 5.4 million job openings in the U.S. in April -- the most in 15 years. It is a record since the Bureau of Labor Statistics began tracking monthly job openings in December 2000. The current surge was even better than expected, according Peter Boockvar, chief market analyst at the Lindsey Group. It's another sign the economy appears to be rebounding and the winter slowdown was a blip. Who's hiring? Over the past year, health care, business services and social assistance have had the most openings. That trend continued in April with an uptick in health care positions. Businesses across America are looking for employees, although the biggest increases in vacancies recently have been in the west. The main industry that continues to struggle is mining and logging, which was hit hard by the dramatic decline in oil and other commodity prices in late 2014 and early 2015. Good sign for the economy: More openings will likely lead to more hiring, although it's not always a one-to-one match since some jobs require more skills and experience than what many job seekers have. 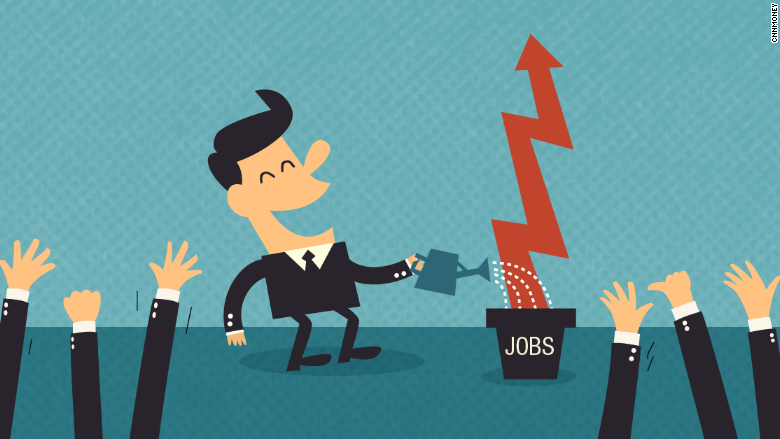 Unemployment is now 5.5% in the U.S., down significantly from 6.3% at this point last year. In another encouraging sign, about 2.7 million people voluntarily quit their jobs in April. They don't typically do that unless they believe there's a better (and often higher paying) job out there they can get quickly. The number of people quitting their jobs increased in December and has stayed around the 2.7 million level since. "For those ready to work now, the job openings are clearly there with a skills match being the key needed fit," said Boockvar.